1. Chop up all of your veggies (onion, carrot, shallot and mushrooms) and set them aside. 2. Coat your short ribs with salt and pepper on a plate and set aside. 3. Heat the butter and olive oil in a dutch oven or Le Creuset on high heat. (You need a pan that is heavy duty and can go in the oven.) When the butter is hot and melted, add the short ribs and brown them on all sides, about 45 seconds per side. Remove them from the pan and set aside. 5. Turn the heat to medium-high and add the veggies to the pan. Saute for about 3-4 minutes. 6. Add the red wine to the veggies and bring to a boil. Then add the broth and some more salt and pepper. Stir to combine. 7. Nestle the ribs into the veggie/liquid mixture so they are almost covered. Add the thyme and rosemary sprigs to the liquid. 8. Cover and cook in the oven at 350 degrees for 2 hours. Then turn the heat down to 325 degrees and cook for another 45 minutes to an hour. When you remove these babies from the oven, they will be tender and falling off the bone. 9. Either refrigerate overnight, and skim the hardened fat off the next day, or allow to sit for at least 20 minutes and scoop off as much of the liquid fat as possible. 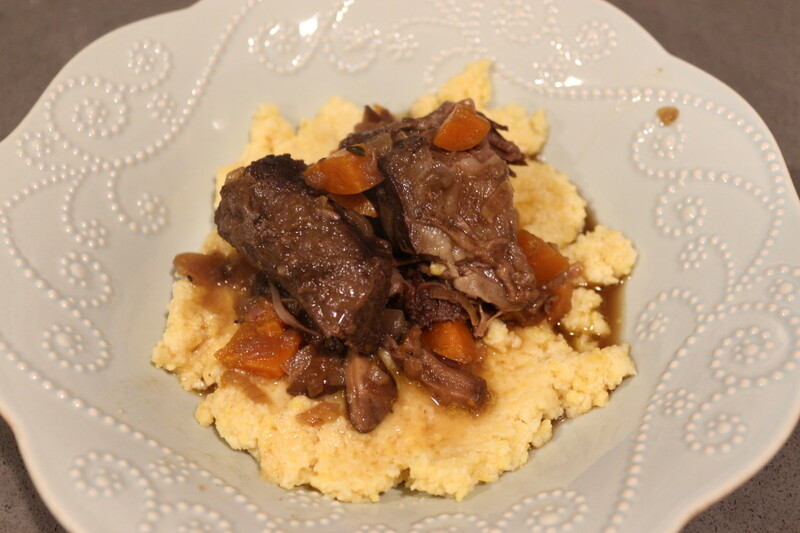 Serve over polenta or any other grain or green of your choice. 1. Bring the milk, broth and salt and pepper to a boil. 2. Add the polenta and stir to combine. Allow the polenta mixture to simmer and cook for about 15-20 minutes, stirring frequently to prevent sticking and lumps. 3. Remove the polenta from the heat and stir in the goat cheese. Add any extra salt and pepper to taste. Enjoy topped with short ribs and sauce! This entry was posted in Mains, Sides and tagged Carrots, CHEESE, Gluten Free, MuSHrOOms, polenta, WiNE. Bookmark the permalink.